Ever been told the sky is the limit? Well, not anymore. It’s time to elevate your criminal empire, taking your assets and your profits in the only direction left to go: straight up. Welcome to GTA Online: Smuggler's Run. LF-22 Starling - One moment you're on the runway, slowly inching into position, wondering what all the fuss is about. The next, you're 220 feet in the air and rising, a shrieking human speck on the front end of a blazing rocket trail headed straight for the stratosphere. The LF-22 Starling packs mounted rockets, optional homing missiles and bombs for extra punch. Available from Warstock Cache & Carry. Mammoth Tula - Remember the kid who always had a multi-tool with him? Remember how popular he was? Well, if he had survived high school, there's only one set of keys he would have in his fanny pack: the Tula is a quad-prop monster with VTOL and water-landing capabilities, space for turrets and a bomb bay, and the capacity for JATO upgrades. Be prepared. Available from Warstock Cache & Carry. Nagasaki Havok - In the world of tactical air support, bigger is better, right? Wrong. Incredibly small and highly maneuverable, if the Havok was any smaller you’d have to stay on the ground and use a phone app to fly it. Throw the option for a machine-gun upgrade and decoy flares, and you're going into any negotiations with a serious edge. Available from Elitás Travel. Nagasaki Ultralight - What red-blooded American hasn't gazed at an eagle as it soars through an empty sky, refined by millions of years of evolution into the epitome of aerial dexterity and lethal precision and wondered: what could be more dignified, more transcendent? Well, now you know. Available from Elitás Travel. V-65 Molotok – The poster child for brutalist military chic, the V-65 Molotok has been reproduced in juntas and dictatorships right across the developing world, and that's not just because of the lethal efficiency of its twin nose-mounted machine guns. It's because when you look this merciless, the battle's won before you've even taken off. Available from Warstock Cache & Carry. Western Rogue - To the casual observer, the Rogue looks like a classic, single-prop training aircraft. And that's exactly what you want them to think. Because with room for machine guns, missiles, anti-intercept countermeasures and a full-size bomb bay, you'll have those casual observers running for any available cover. Available from Warstock Cache & Carry. In this brave new world of low-duty high-profit trade you have to look the part - and no self-respecting smuggler would be seen dead or alive this season without the latest clothes and tattoos. So whether you’re an urban pirate, a fighter ace, or you just need some thermal and night-vision headgear for your next cargo sale, there’s something new in town for you. UPDATE: Check out the snapmatic contest and bonus unlocks here. 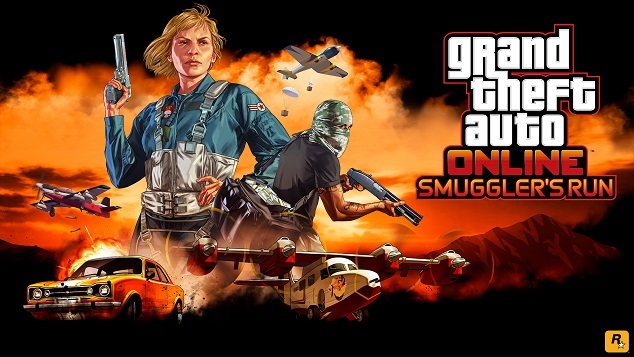 GTAO Smuggler's Run Now Available - The next major update for new-gen GTA Online is here: Smuggler's Run. Plus another Adversary Mode titled Motor Wars.